LCPD school resource officers post in fron of the Justice Building in Logan. 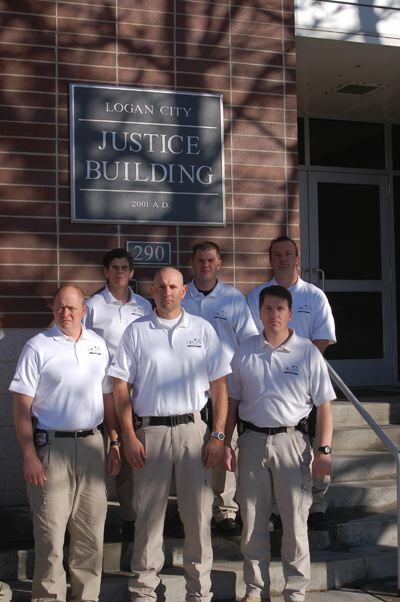 These officers are assigned to the various schools in Logan. March 27, 2009 | LOGAN ­ School resource officers who are assigned to work in the Logan School District do much more than just patrolling the halls to make them safe. "Its not just your typical police officer-in-the-school to make sure that the kids aren't misbehaving. There is a lot more to it than that," said Sgt. Louise Speth of Logan City Police Department, who is in charge of the detectives that work in Logan's schools. "They also do a lot of education, a lot of outreach, a lot of [public relations work] for the department," said Speth. "They all had successful careers in patrol, and now have moved into school resources division because of some skills and talents they showed, that broadened their police role." One of the educational services that the officers at the elementary and middle schools offer is by teaching a relative new program. "We do implement what we call the NOVA program," said Speth. Nova stands for "Nurturing Opportunities, Values, and Accountability" and has been taught in elementary schools for the past two years, and at the middle school for one year, said Sgt. Denny Bird. "It is not like a new DARE. It's a different program," said Bird, who teaches NOVA to fifth-grade students. He was referring to the old Drug Abuse Resistance Education that was previously taught in Logan schools to warn children of the dangers of alcohol and illegal drugs. "It talks about not using drugs, but it also talks about self esteem and bullying, Internet safety, anger management, and many different topics," said Bird about the new program, which he feels is more up to date to the challenges that face youth today. "It was something that would fit better for our community," he said. "It is looking for good opportunities, and then holding people accountable for their choices and actions." While NOVA is taught to students in the fifth and sixth grades, officers at the various schools offer a wade variety of services to educators and school administrators. "I think we just do a wide variety of all sorts of classes for the teachers," said Sgt. Nate Mutter, who also teaches NOVA to sixth grade students. "Almost whatever we are asked to do." Besides the officers assigned to the elementary and middle schools, others are assigned to the high schools, including Logan High School, Bridgerland Applied Technology College, and Fast Forward charter high school. Among the services that these officers provide include classes in dating violence, inappropriate cell phone use, possession of illegal substance (drugs and alcohol), and pretty much what teachers may ask them to, said Sgt. Anthony Williams, who works mostly with BATC and Fast Forward. "And after school it's scouts, community groups, and church groups, peer court, and everything else," said Williams, pointing out that because kids are already familiar with these detectives, they are asked to participate in various events besides school activities. Besides offering these services to the schools, these officers still have to enforce the law and keep the schools safe. "I think what you'll see with these detectives that they do enforcement," said Speth. "There are criminal cases that come up." While LCPD said crime is not a big problem at the high school, some issues like theft and truancy do have to be dealt by these police officers. "Every type of crime that I can think of, kids are involved somehow," said Williams, explaining that while children often are not the ones who commit the crimes, they may know who is, or somebody who is affected by it. Often, children request to talk to these officers by name when police investigate other issues, he said. "They're obviously very concerned with school safety, working with the school faculty to make sure that the school campus remain tamed in a safe way," said Speth. These officers and others of LCPD are also prepared to respond to any crisis that may arise at the schools, said Capt. Jeff Curtis. He said that recently, LCPD personnel went to the Swanson Training Center, a facility in Ogden designed to help law enforcement train in various types of emergencies that they may face. "People know that we are well prepared here in Logan, and that keeps them from coming here to cause trouble," said Williams, who is also a member of SWAT team, a special unit trained and equipped to deal with a variety of police emergencies. While police cannot go into the details of the training these officers receive, Curtis said that the LCPD is well prepared to deal with any crisis that may arise at the schools, or elsewhere in Logan.